Wölvhammers are only available from 45North dealers that have pre-ordered them from our distributor. Please see our dealer locator to find a dealer nearest you. Boots are anticipated to begin arriving at 45North dealers the week of December 10th. We had hoped they would be available several weeks earlier and are doing our best to get them available as soon as possible. There are many anxious people waiting to put some of these amazing boots on their feet this season, and we would like to thank you for your patience. Stay tuned to Chronicles and the 45North Facebook page for announcements of evening fitting sessions with select dealers during the month of November, when you will have a chance to see the boots in person and try on any size. In the meantime, we will give you a more detailed look at the Wölvhammer below to show you features that are not pictured on the product page of our website. 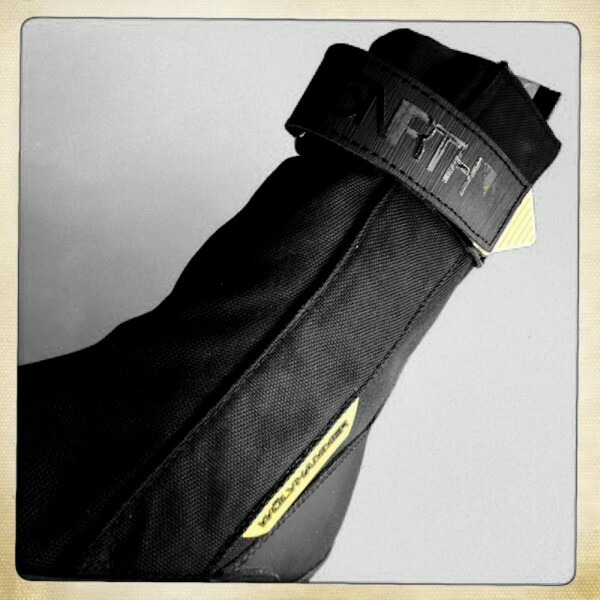 The ankle strap comes with a black screen printed 45North logo for some added style and a cleaner look than the embossed versions that were displayed at Eurobike in Friedrichshafen, Germany at the end of August. 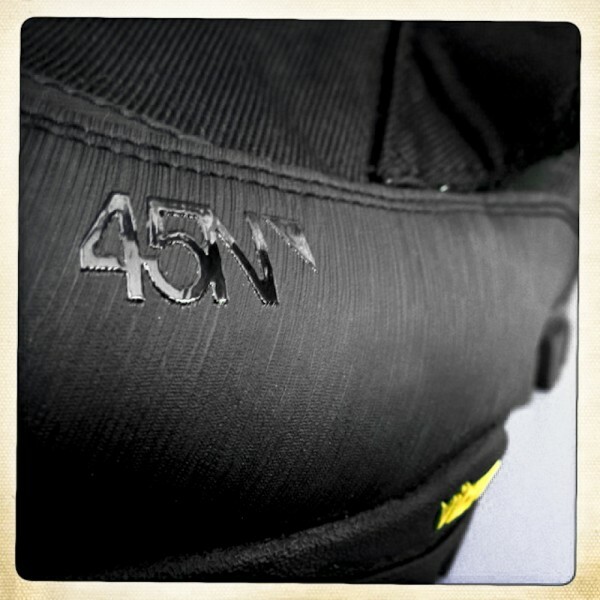 There is also a small screen printed 45N graphic on the mudguard that covers the toe box. The above image also provides a close-up view of the textured coating that protects the natural leather from salt and moisture that causes deterioriation. The following series of images will walk us through the outer closure of the boot to the inside, where we'll move on to show you how the simple inner lace closure works. The 1000 denier Cordura is formed into a flap backed with velcro loop that fastens itself against the YKK water-resistant zipper. 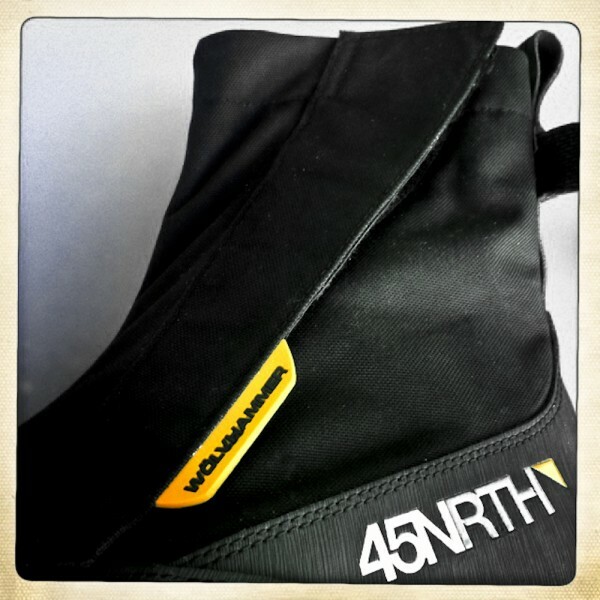 You can also see how the natural leather mudguard intersects with the Cordura and the 45North logo is embossed and screen printed. A durable thermoplastic rubber (TPR) tab prominently displays the “Wölvhammer” model name. As you begin opening the boot you will experience how the outer closure works. 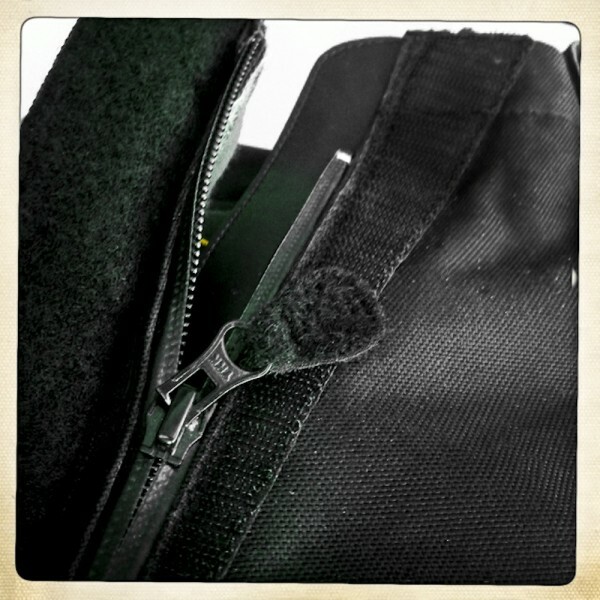 There is a tab of velcro loop connected to the zipper pull tab that effectively extends the grab area for your fingers and allows you to store it securely against the velcro hook as pictured above. It also keeps the pull tab flat to prevent bulging and discomfort against your leg. To the left of the zipper you will see the back side of the Cordura flap with velcro loop that fastens flat against the hook to conceal the zipper. With the boot fully unzipped you will see how we built a three-piece weather guard to block moisture from entering through the outer closure. First, the Cordura flap conceals the zipper (as pictured in the first photo of this series) - snow, slush and water do not even hit the zipper. Second, the YKK zipper is laminated with a water-resistant coating that blocks moisture by itself. 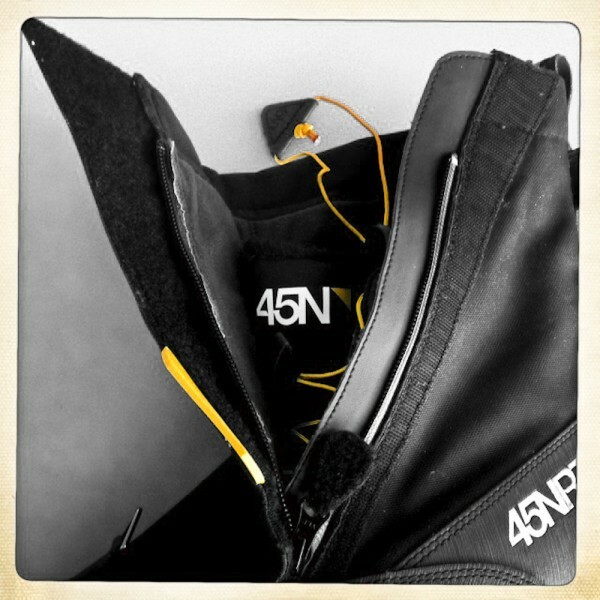 Third, a sythetic flap is placed behind the zipper in the rare event that moisture gets beyond the zipper. In summary, we use a durable water-resistant zipper and construct layers of protection on both sides of it. Now it is time to move on to the closure on the inner boot, where we use a simple cord lace and cinch lock to secure your foot. This system is durable, completely sealed from the elements, and most importantly, the laces are replaceable using any 2mm cord lace. When first putting on the boot you will want to fold down the outer gaiter to expose the laces. You will find a pull tab attached to the cord laces for you to pull the laces so you can open the throat of the inner boot up. Please note that the tab pictured above is black. The production Wölvhammer will come with an orange pull tab. 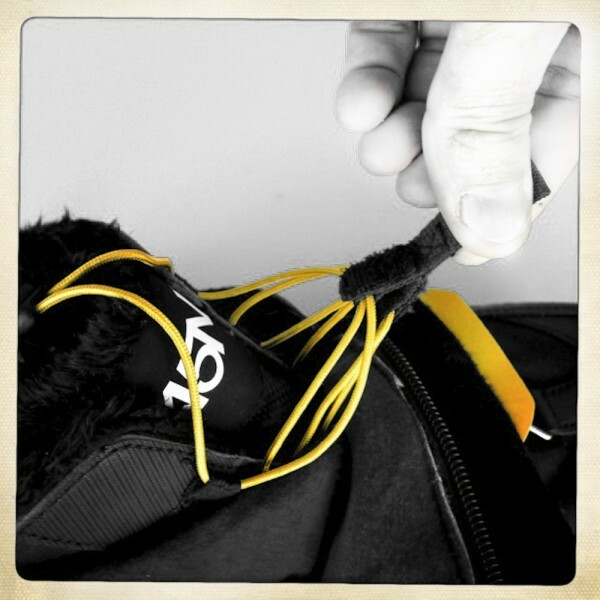 At the end of the cord laces you will see a triangular tab that has velcro loop on the back. This velcro-backed tab attaches to the pull tab on the laces to keep any excess laces stored securely and out of the way once they are cinched down. In the above photo you can also see the laterally oriented heel grab to help make it easier to get your foot into the inner boot. Above you will see how the two tabs meet and use velcro to attach to each other. 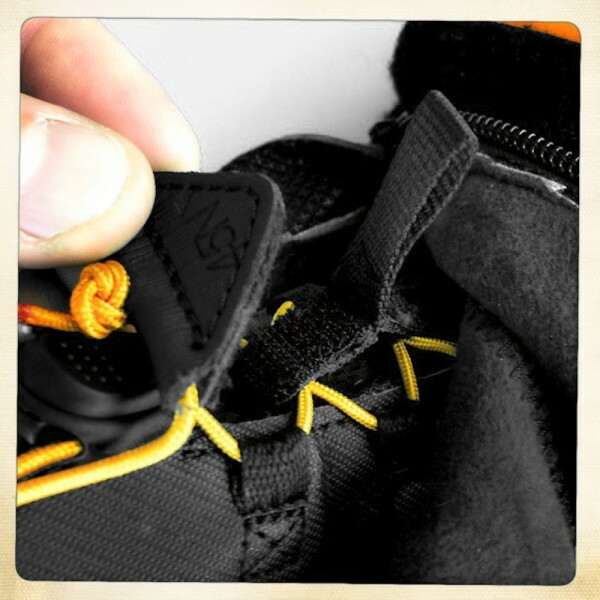 This picture also illustrates how we use flat loops of webbing instead of metal rivets to route the laces. This provides better pressure distribution on your forefoot and eliminates cold metal objects in an area critical to keeping your foot warm and comfortable. Many years of experience riding in Minnesota winters have gone into the design and development of the Wölvhammer. The technical details in this post mostly serve as a mechanical tour of the boot's architecture. In addition to these mechanical technologies, we use advanced materials to help keep your feet warm and dry. One of these technologies is the aerogel used in the Jaztronaut insoles that come stock in the Wölvhammer. Click here to read our post about aerogel as used in the Jaztronaut insoles and stay tuned for future posts that go into greater detail about other advanced materials used in the Wölvhammer.